Snack Girl keeps working on the perfect pancake. It is the "cake" part that gets me striving for the elusive goal of tasty and nutritious. Now, I am once again reworking my "Overnight Pancake Recipe". My big change is to use a form of whole grain flour instead of white flour to amp the nutritiousness even more! My favorite flour is White Whole Wheat because it is lighter than regular whole wheat - and it still includes all of the bran in the flour. I have stopped using white all-purpose flour in my recipes because I find that my baked goods with the white whole wheat flour taste almost the same and are healthier for my family. The great attribute of pancakes is that they are so fast to make. I have added an "overnight" step here because the oats in the recipe get softer when they soak up the milk. They add a nice texture when you get around to making them. You can leave this in the fridge for a couple of days and then cook as needed or cook them all at once and pop them in the microwave to reheat. These are also a great anytime snack. They look like a cookie, but aren't as laden with calories or sugar. Check out this oatmeal treat for another overnight favorite: What TO Have for Breakfast. How do you make your pancakes healthy? Would you have used about 1/4 C of batter per pancake? @Jill - yes, that seems about right - the photo above is the size that I make them. 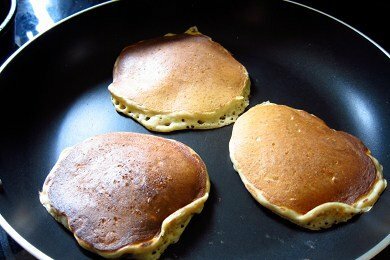 They are a bit difficult to flip if they get bigger because they are heavier than regular pancakes. I'll throw in oats as well though not in an overnight recipe. Also: flaxseed or oat bran. I also have used yogurt as a substiute for buttermilk for my mom's pancake recipe. Have switched out the white sugar for brown or maple syrup or honey. Have done half and half white spelt and whole spelt. Also, EVOO or melted butter or ghee are interchangeable. Have thrown in cinnamon, five spice, pumpkin spice, banana with nutmeg, lemon zest with blueberry. I think I'll try savory pancakes-maybe with onion or carrot or zucchini-for dinner one night. And try the overnight recipe. Baked at 375 for 18/20 minutes. The cup of berries can be anything - Also works with chocolate chips! I love Trader Joe's toasted oat bran. It's got around the same amount of calories as oatmeal per serving (130/ 1/3 cup dry vs. 150/ 1/2 cup dry for oatmeal but they make around the same amount of hot cereal because you need more water in the oat bran to make it thin enough to eat.) AND it has twice the fiber. It's good 50/50 with oatmeal (as it doesn't have the oatmeal texture and is smooth) as a hot cereal and works well in recipes. I have a son that has issues with dairy. I was thinking I could replace the milk with almond milk. What would be the best substitute for the yogurt. I have some issues with soy products. I was thinking maybe applesauce?? Also~ I love your site~ such great useable info. Does your son also have problems with yogurt? From what I've read, fermented dairy products can be eaten by people who have isssues with regular dairy. I've used different milks for panckaes including almond and rice. I noticed in the energy bar recipe the yogurt did soften the finished product, so perhaps applesauce would do the same thing. Awesome :) thanks for the recipe! For me, I put in ~1 tbsp flax meal into my pancake batter, omit the sugar (and if I want, a quick drizzle of honey or agave into the batter to sweeten), and use 2/3 apple sauce + 1/3 oil when oil is called. Oh, and I read on another blog that soaking the oats makes the oats absorb more nutrients or makes it more nutritious. We are currently taking out ALL dairy for a "trial run." It is proving harder than I realized it would be. We do know for sure he has issues with liquid cows milk. I am thinking of trying raw milk as I make our yogurt. Thanks- I'm going to try the recipe this weekend. This is very close to what my husband and I make! I love oats in pancakes - I find it makes them heartier and gives great texture. We almost always add blueberries to our pancakes! I don't know about adding them to sit overnight, but just before you throw it in the pan, add a cup of blueberries for a nutrition boost! Such a good idea! I have an alternate recipe for oatmeal pancakes that is actually quite quick to make (I use quick cook oats as my only alteration). Our boys love it. It is from a cookbook called "Three Bowls". I'll send it your way ! I made this today and they were delicious! Everyone loved them. I'll never make regular pancakes again! I always use ww flour and substitute part of the flour either with ground flax seed or wheat germ. This lightens the flour (for pancakes or muffins)--not so heavy as using all ww, but with no white flour. (I usually add some soy flour too). Lisa, have you tried baking with Whole Wheat Pastry Flour? It's a lot lighter than regular whole wheat. I be it would be great in this recipe. I made pancakes with oatmeal before and no flour at all. They were delicious. I think I'll give yours a try this weekend. I love the fact that they have yogurt to add protein. Do you use regular or Greek? @Kristen - Thanks for the tip - I used regular yogurt but Greek would work. Great comment! I just made these with non-fat Chobani plain greek yogurt, added in vanilla and cinnamon and 3 tablespoons of flax seed and other seed mixture, and these were very yummy. I'm happy with the taste and the amount of protein.